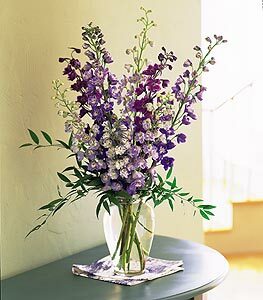 Take the chore out of ordering flowers to brighten your home or office! We will have fresh flowers delivered every week to where you want them. This program includes a discount on the arrangements and free delivery on a schedule that is convenient for you. We will customize your weekly floral arrangements to suit your desires, which will include a variety of flowers and greens that can change every week. Nature can hold the secret to business success. Idea generation, creative performance and problem solving skills improve substantially in workplace environments that include flowers and plants. Michi’s also serves corporate customers with the finest in flowers, plants, and baskets for business gifts, sympathy expressions, and employee programs. Commercial volume discounts are available. Please call us at 408-778-0523 for more information on how we can serve your business. You work hard to decorate your home to reflect your personal style, and to create a warm and inviting atmosphere for your family and guests. Adding fresh floral arrangements brings exquisite individuality and charm to any home decor. We at Michi’s can help you match flowers to the style of your home.